I’ll have the last of the cabinet doors done over Thanksgiving and put in the top cabinet doors to the glass shop to be fitted up. We’ll start on the breakfast bar conversion to a bookshelf through December. I wish the Fairy Godmother could send some cash but as it is we are moving forward… just more slowly then I had planned. Okay, here we go folks, I’m starting the kitchen! Yeah! Before I got started on this cabinetry project, I did a test door. This is essential on a large project of this scope where there isn’t room for error. 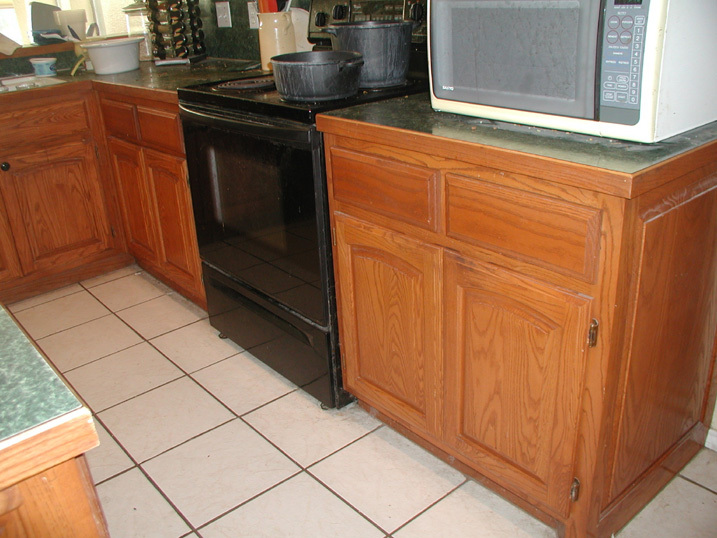 These cabinets were solid oak and really the only issue is the original stain – they are not damaged or ill-made. With the test door, I tried darkening it with stain and it gave very uneven and mixed results. Paint was definitely the way to go and if you choose to go with regular paint, go with enamel not latex. 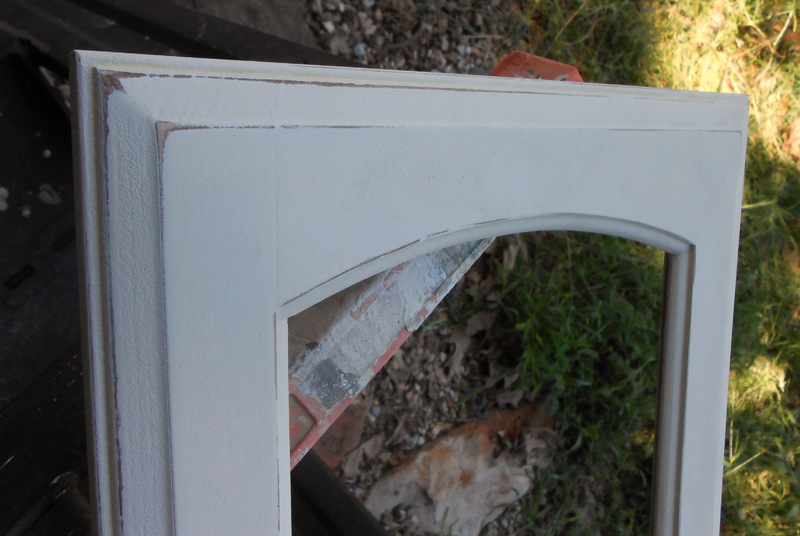 The big reason I chose Chalk Paint is how it adheres to the wood, how it distresses and the end finish. 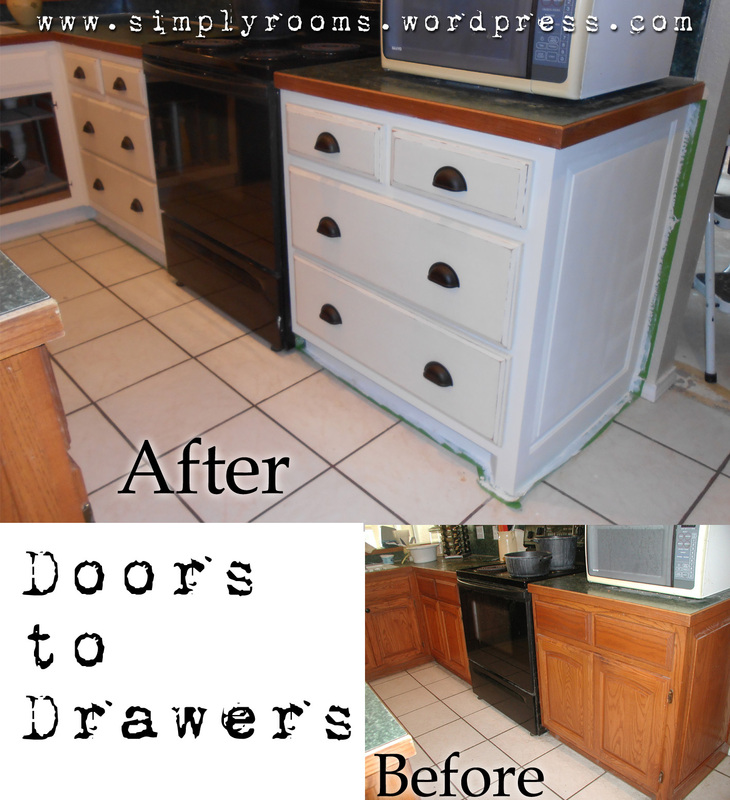 All the cabinet doors and their hinges were removed. It’s easiest to get a box and put all the screws, hinges and handles in it right from the start. This prevents stuff being lost. 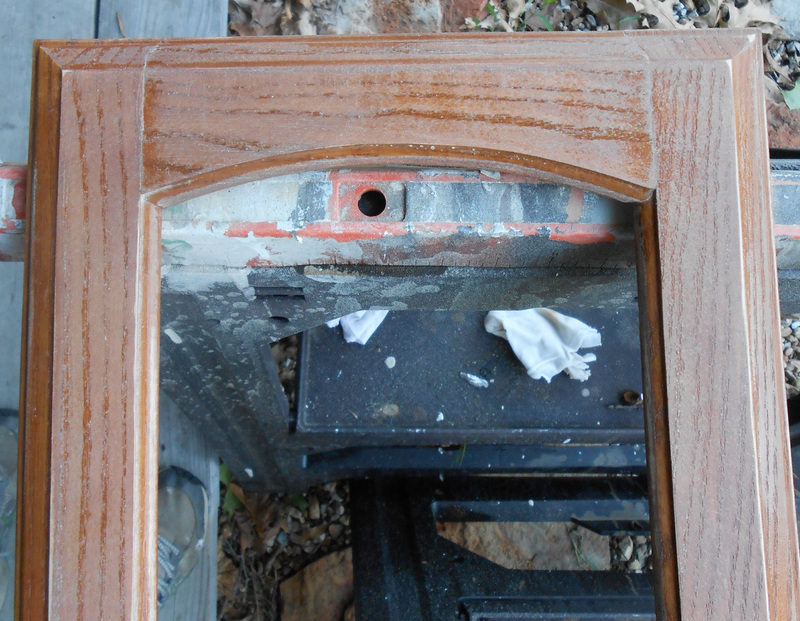 If you were replacing with new hardware you might need to fill in and sand smooth original screw holes. However, this wasn’t necessary on this project as I was re-using the hardware I had installed and the drawers, which were getting new hardware, had never been drilled. 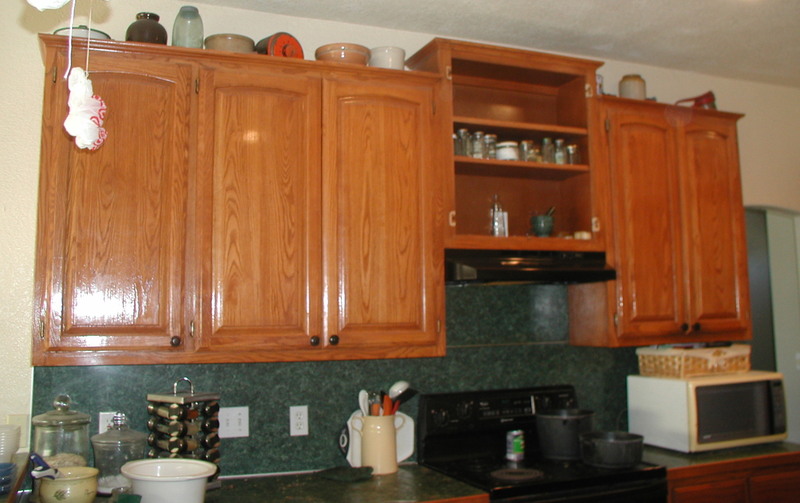 How much prep work you will need to do will depend on the condition of your cabinets. Again, I see a lot of folks skipping prep work because it is slow and tedious. However, lack of prep work WILL impact the end appearance and I don’t care what type of paint you use. 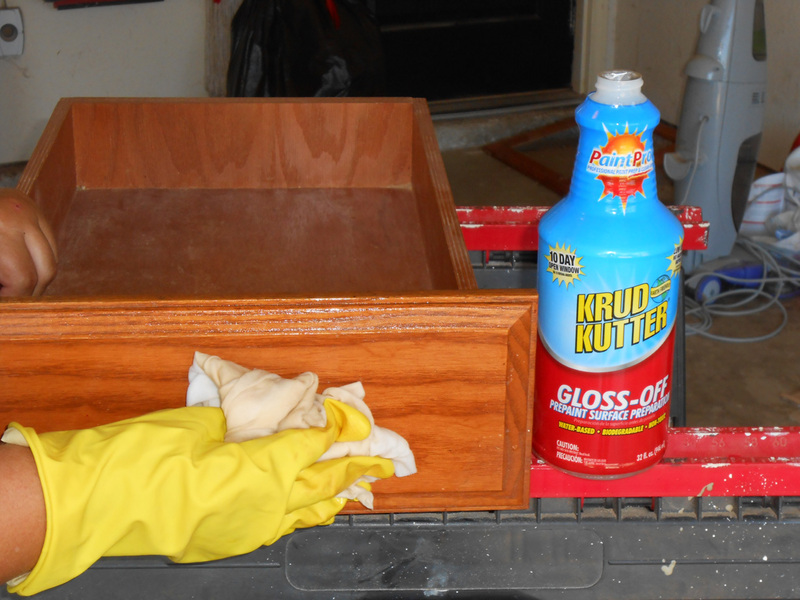 I started with a product new to me: Gloss Off by Krud Kutters. I found this product at the Sherwin Williams paint store for about $8; be careful not to buy the cleanser by Krud Kutters as it has a different purpose. 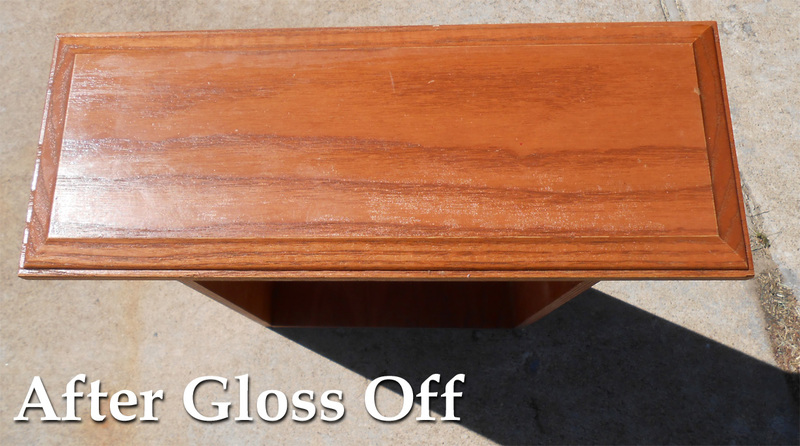 The Gloss Off wasn’t a Miracle Product as it did not remove 100 percent of the polyurethane top coat, however, I did notice it raised the grain and made for easier sanding (80 grit with electric, palm sander). 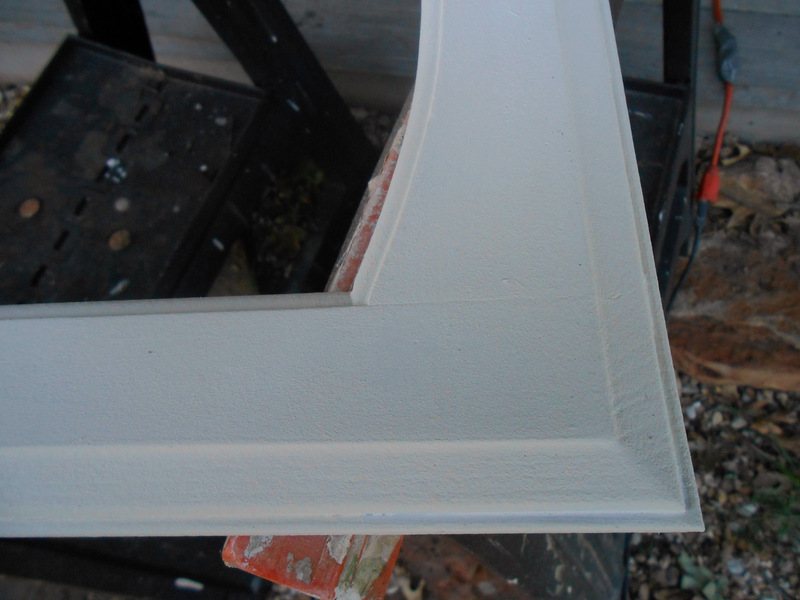 It did seem to help the primer adhere and gave a smoother attachment. NOTE! 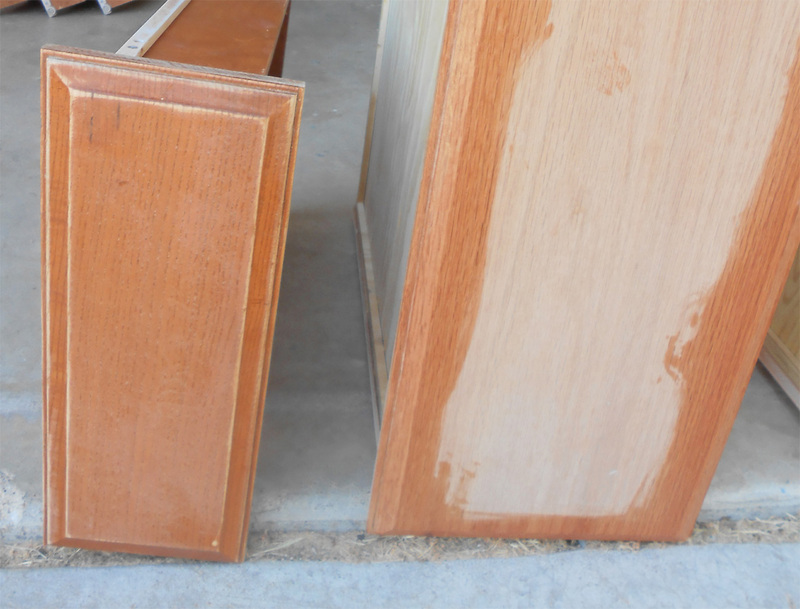 If you decide not to use this option or do any sanding of the original cabinetry, try TSP (Trisodium Phosphate) found at Lowes, Benjamin Moore and Sherwin Williams to clean the doors of any grime before painting or priming. 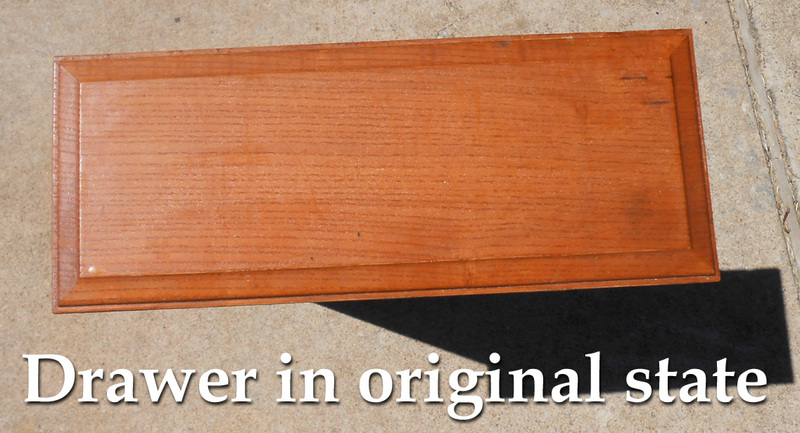 Remember, lack of sanding will result in a more uneven, end surface and the paint layers will distress more. 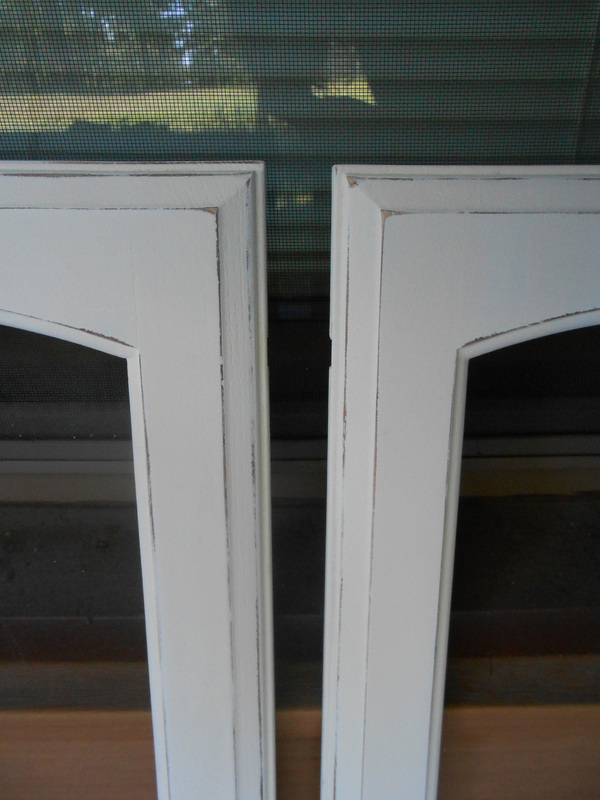 After doing my test door, and seeing that it took three coats of expensive chalk paint before the oak pattern was covered, I decided I would use two coats of a primer (1 gallon = $38) to cut down on the costs of the chalk paint (1 quart = $38). 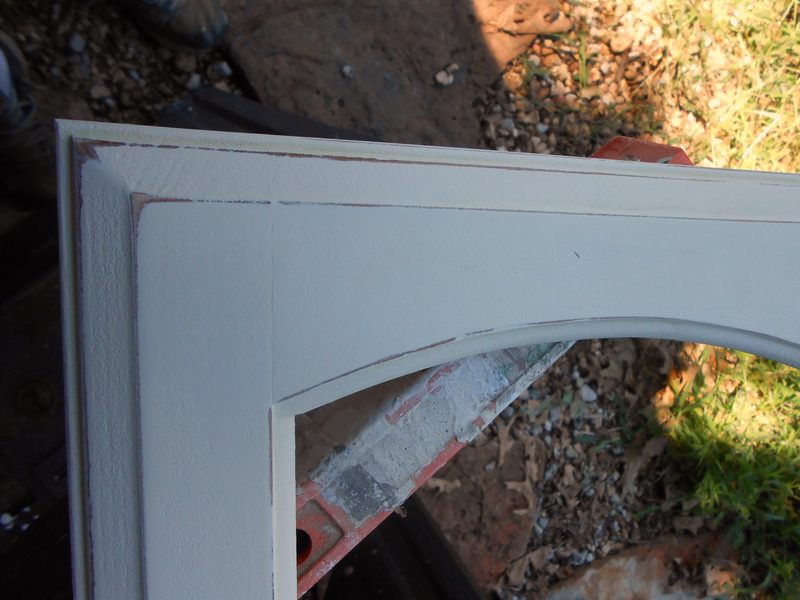 I also think the primer helped the end cabinet as all the paint sanded nicely during the distressing. 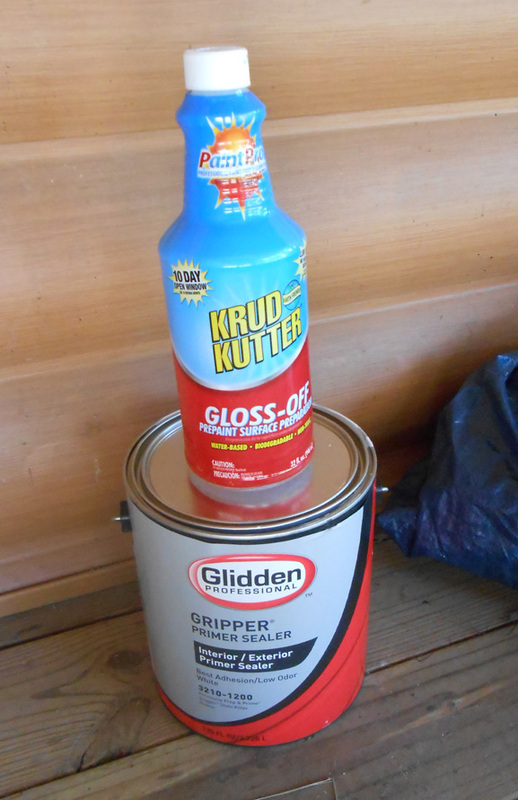 The primer I used was another new product to me: Glidden’s Gripper (comes in white and grey). One thing I really liked about this primer is when I got to the distressing stage, it sanded off smoothly… sometimes with primer or undercoats of latex paint you get the paint peeling off in an unpleasant tearing strip. 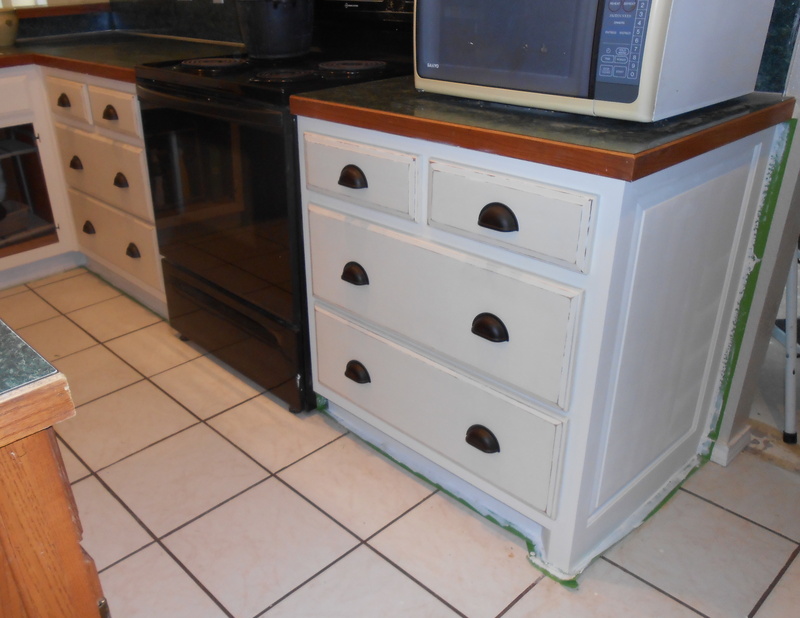 It’s the major reason to avoid latex paint if you plan on distressing. 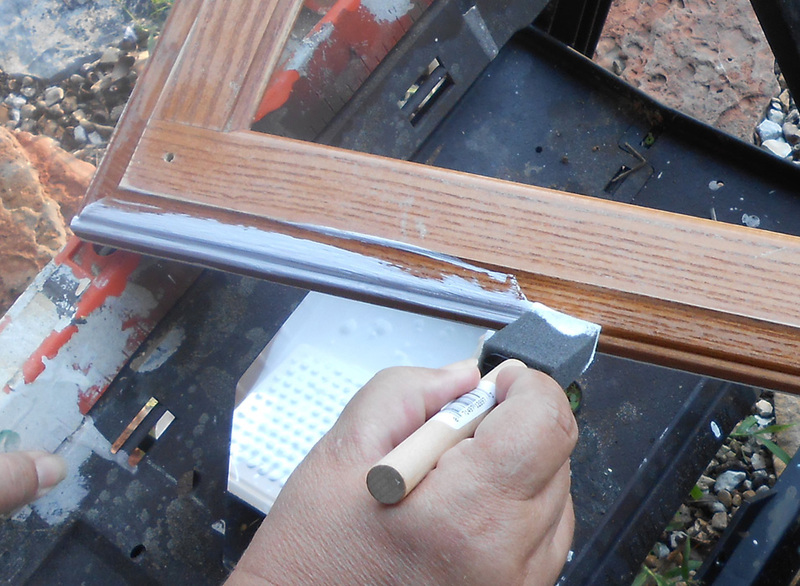 I start with a foam brush and push the primer into the grooves of the cabinet door. 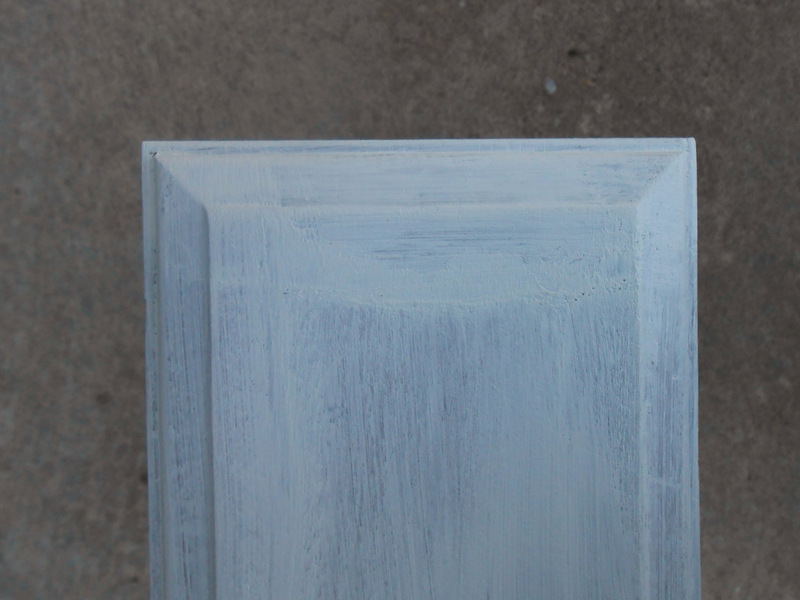 The face of the cabinet door has paint applied with a 4″ cabinet foam roller. 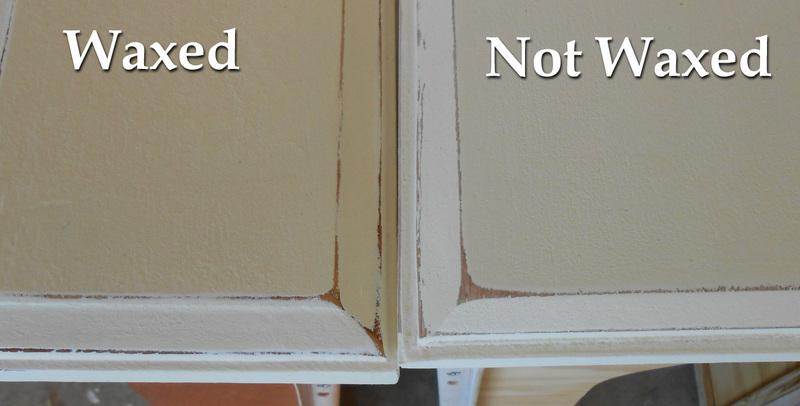 Be sure you get all the edges of your cabinet door and paint the back. Continue to smooth, using the foam roller to work out any bubbles or blemishes. 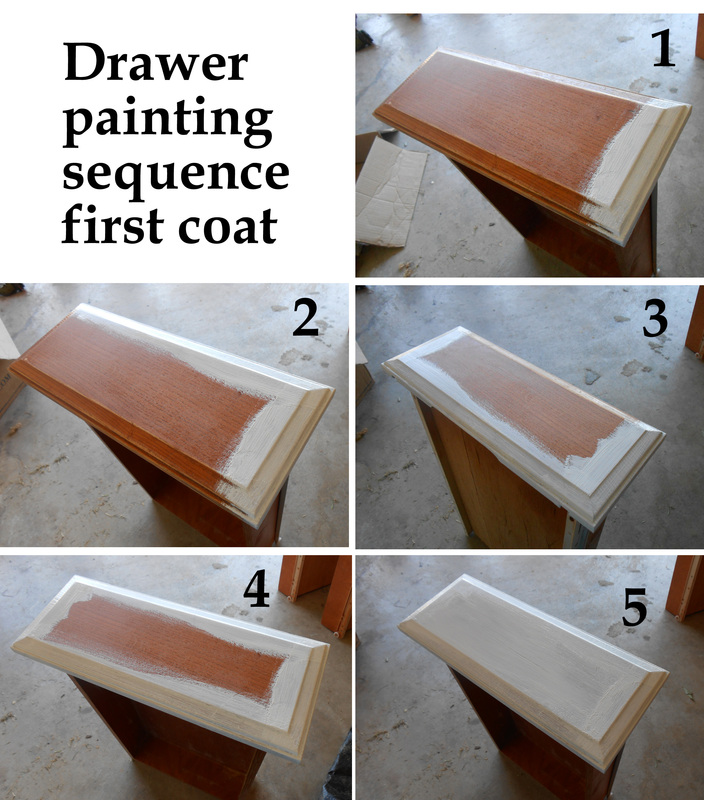 See the product’s advice on how long it should dry before coats. 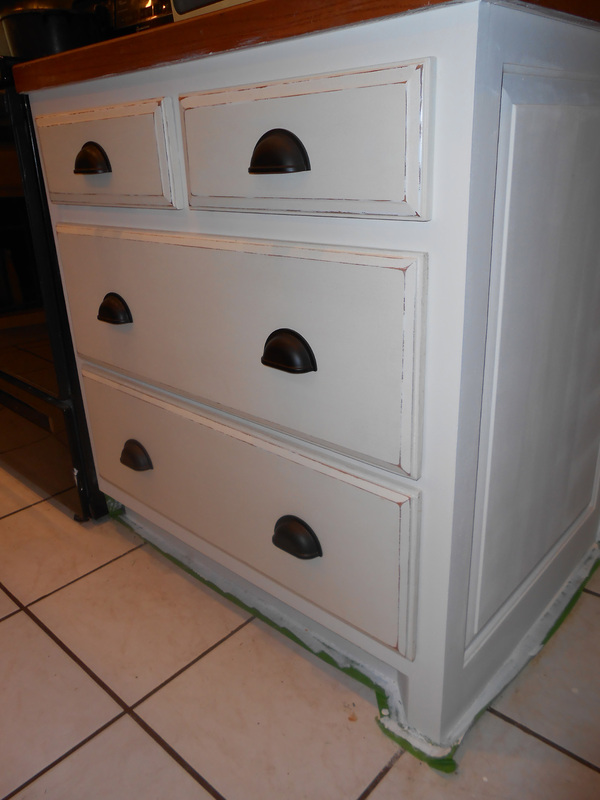 I did the primer the day before I did the chalk paint so it could dry overnight. 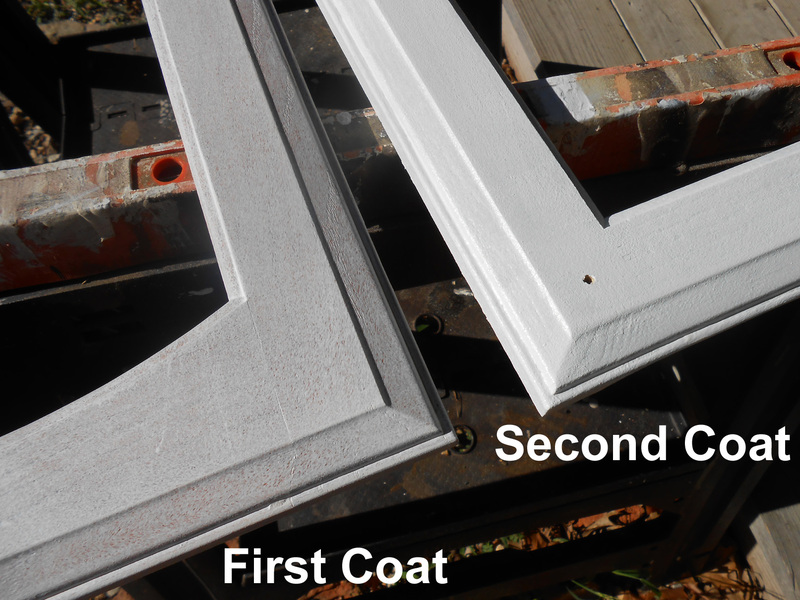 Here is a comparison of the first coat with the second coat of primer. It clearly shows the difference that another layer makes in hiding the oak grain pattern and giving a uniform, end color. 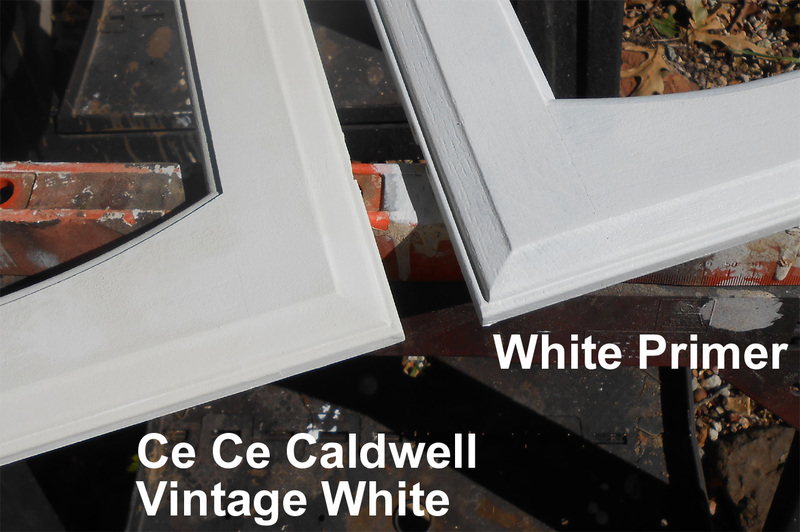 After the priming coats are completely dry, next is the Ce Ce Caldwell Chalk Paint in Vintage White. 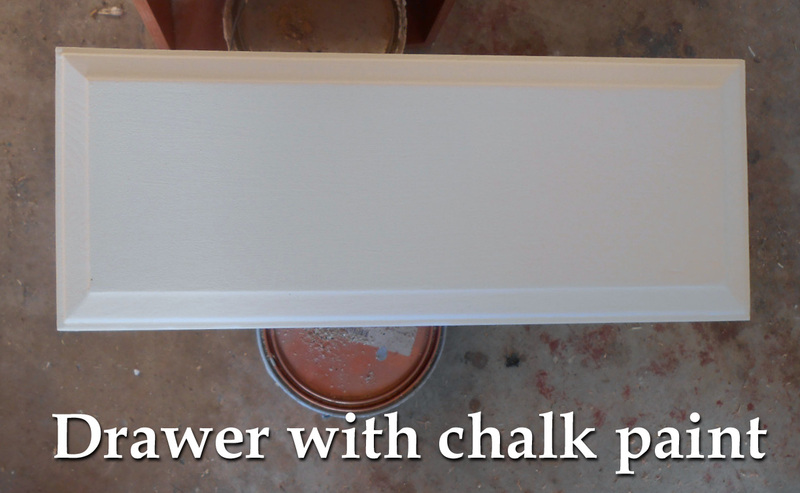 If you prefer Annie Sloan Chalk Paint the directions that follow will be the same. This is applied with a foam paint roller. 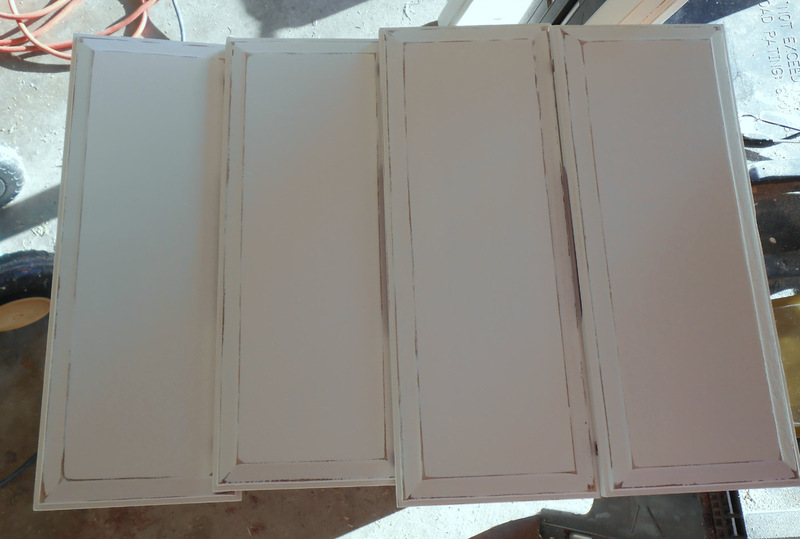 I did the backs (let it dry), and then the cabinet face and the edges (let it dry). This stuff dries quickly so this step will easily get done in a day depending on how many doors you have to do. When you click on the above photo, you can see that the Vintage White has a creamy color, like light colored eggnog. You may not be able to tell from this photo, but after the chalk paint dries, there is a rough surface due to the foam roller application and the nature of the chalk paint itself. 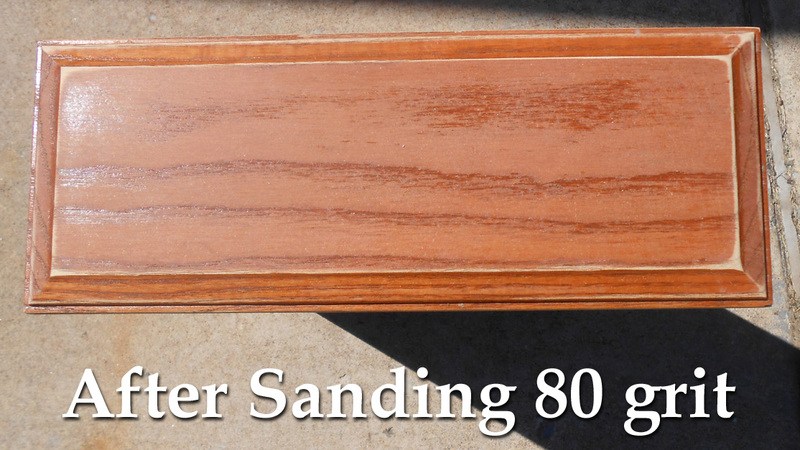 I used the electric Mouse Sander (also called a palm sander) with 220 grit and LIGHTLY sand it smooth. 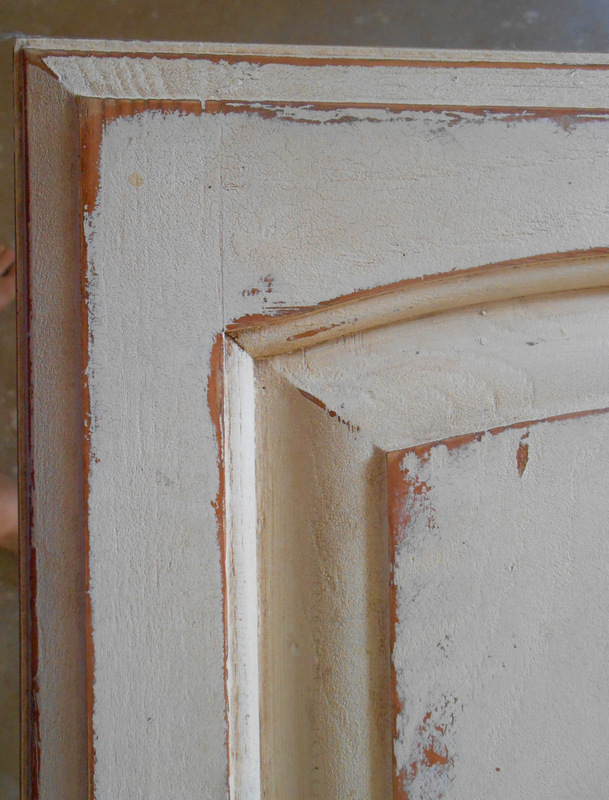 I first sand all the edges of the door as this is where drips may have occurred and then do the cabinet face. This removed the dimpling that the foam roller caused but be careful with how much you do or you will start distressing. 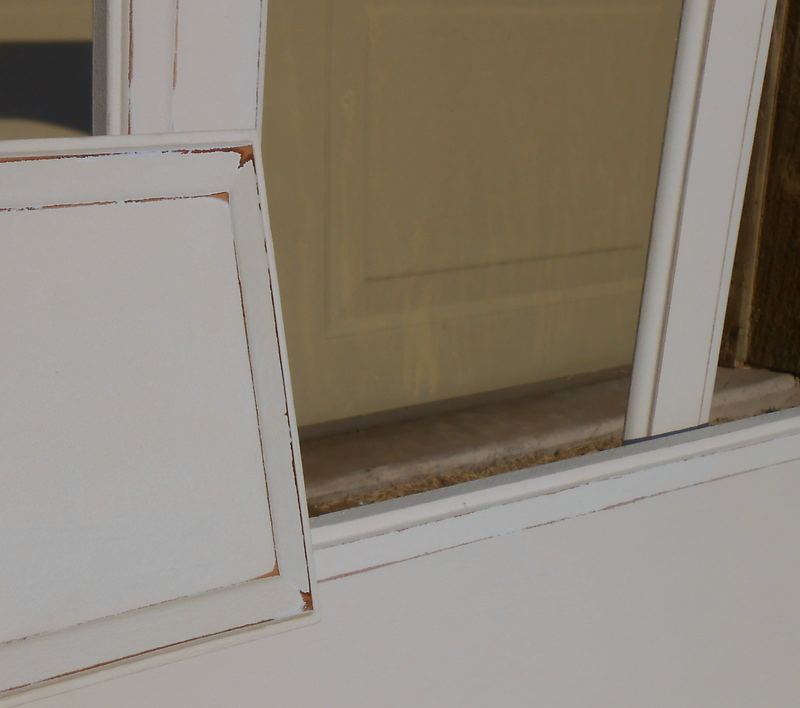 From the test door I did, I knew what distressing I liked. 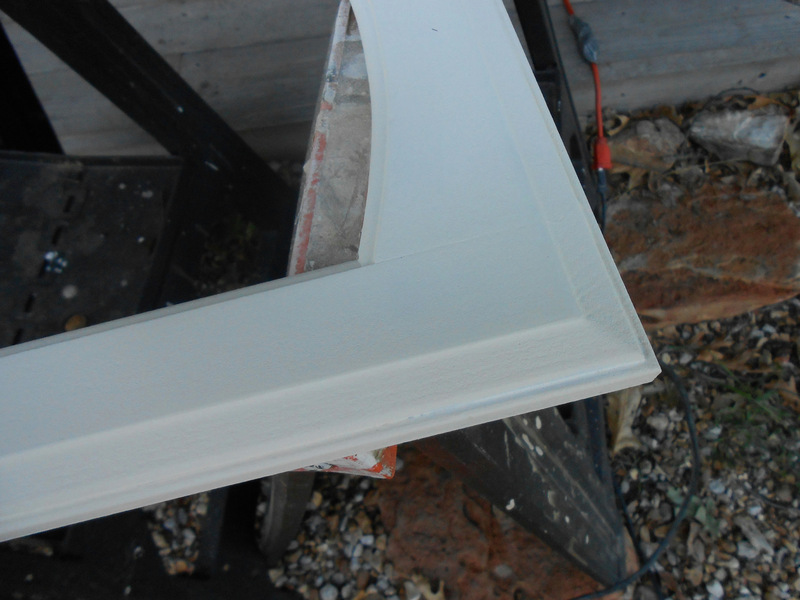 Using the Mouse Sander and 220 grit, I work around the edges of the cabinet profile. I am aiming almost for an outline. 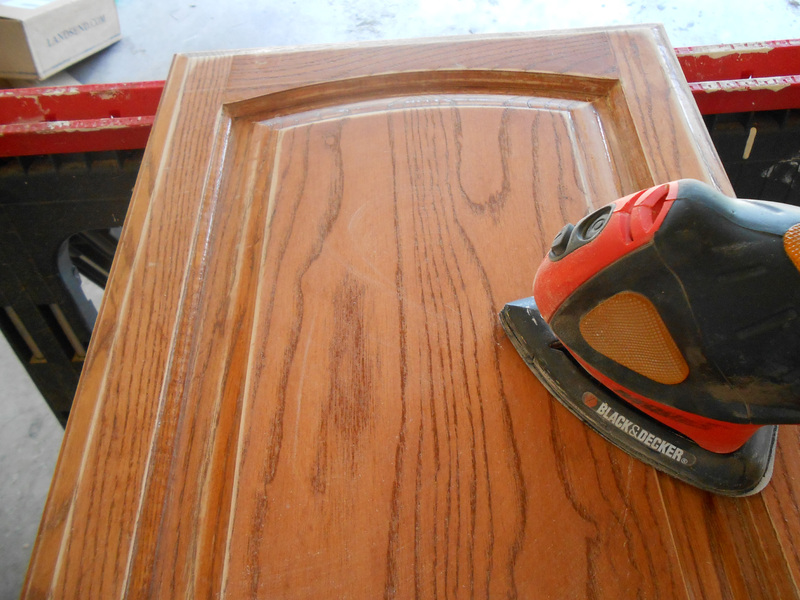 I like to change the direction of the sander, zig-zag it against the door edge, and apply different amounts of pressure depending on how much I want off; this is where experimenting with a test door can really help you. One thing I noticed is that by having the two layers of primer and using a higher grit of sandpaper (220 as opposed to my usual 120) I got a much softer distressing which was exactly what I was going for! Distressing is a job that should be done by one person and if possible, all in the same day too for consistency. Always check the doors against each other as you progress through the job. Once everything is the way you like it, it’s time to put on your top coat application. 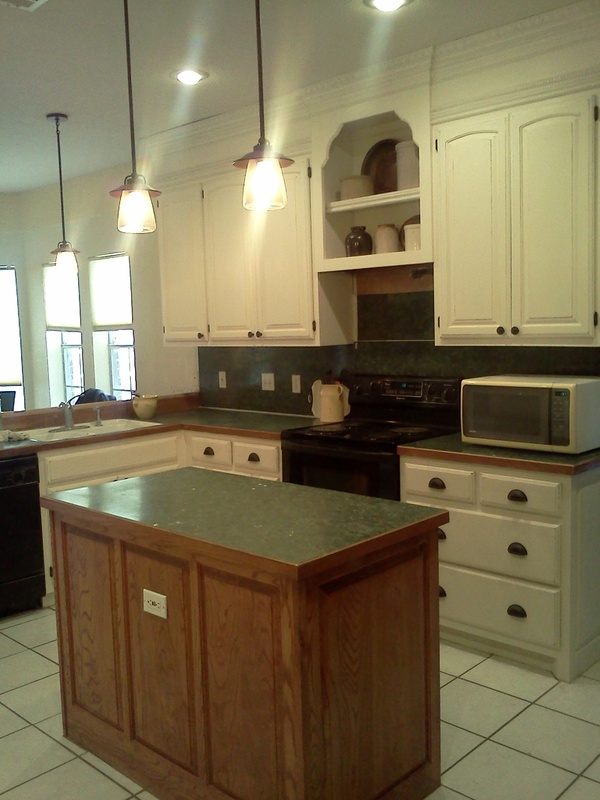 You MUST topcoat your kitchen cabinetry – paint alone will not be enough. In this case, I’m going to use clear wax specifically designed for chalk paint (sold by the chalk paint dealers). 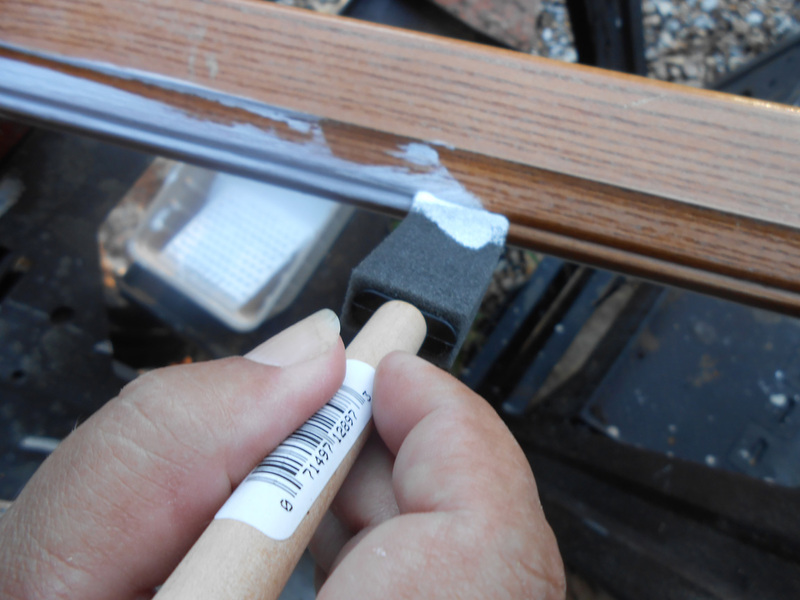 The wax sold with the chalk paint products is a soft, malleable wax that is very easy to apply. The type of waxes you can buy at Lowes or Home Depot are harder, paste waxes and don’t go on as easily. I apply three coats (because it’s the kitchen), with t-shirt rags in a circular motion and let it dry to a haze between coats. One problem I find with wax, is that it builds up in corners and seams. Use a piece of thin cardboard or poster-board to draw out any excessive wax that isn’t able to be smoothed out in these areas. BTW I find applying wax to be hardest job on my wrists. This is another part of the job that having a back up helper would save you time and effort. 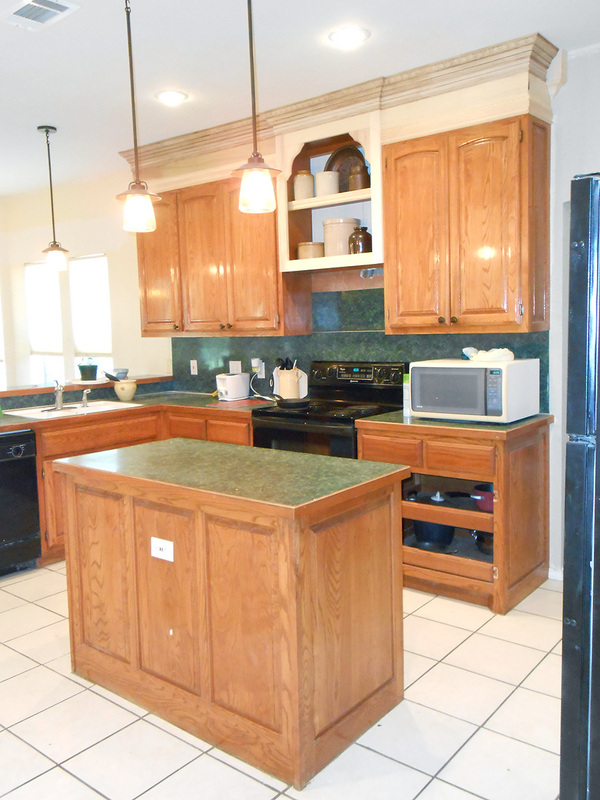 Be aware that in a few years, wax will need to be freshened up on your cabinets to retain their waterproofing. If this is a maintenance issue for you, I would choose another top coat sealant. The chalk paint folks encourage you to wax and than sand. You might want to experiment with that, however, I have to scratch my head… why put on expensive wax and then sand it off? I would rather sand before wax application however, you may find that waxing and then sanding gives you an effect that you like better, especially if you want to use a tinted wax…. Use a test door to find out! Use a custom tinted wax you mixed yourself (clear + paint color). 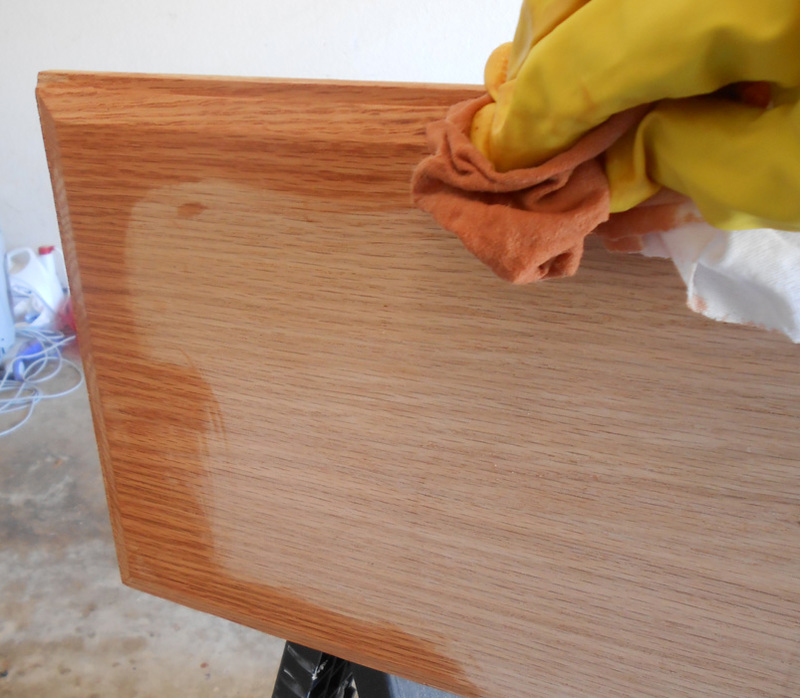 Wax can be worked into the grooves for more definition and won’t change the base color of your cabinet face. Use a dark wax for an aged look. Dark wax is already tinted however, be aware that on some projects it gives a “dirty” appearance that can overwhelm your project especially if you are working in white or cream. I just didn’t think it would look good on kitchen cabinets; I’d keep this back for your antiquing furniture projects. 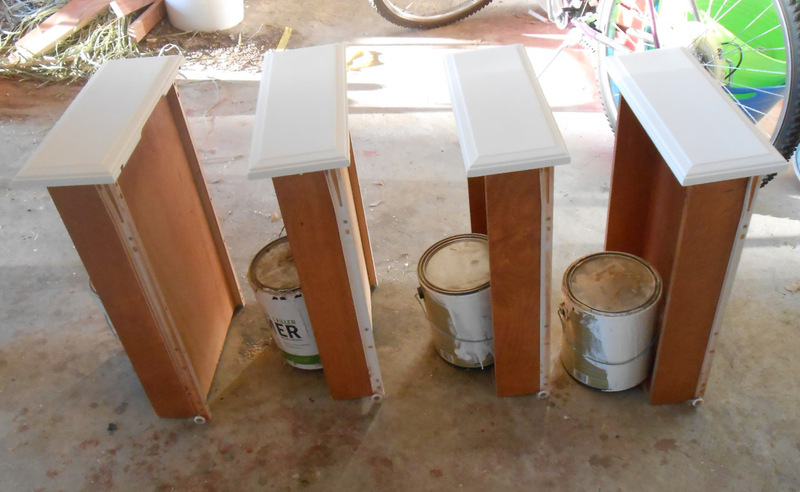 Another choice would have been wipe-on Polyurethane but in my experience with it, it does not give enough of coverage (even after 2-3 applications) to really protect the undercoat. 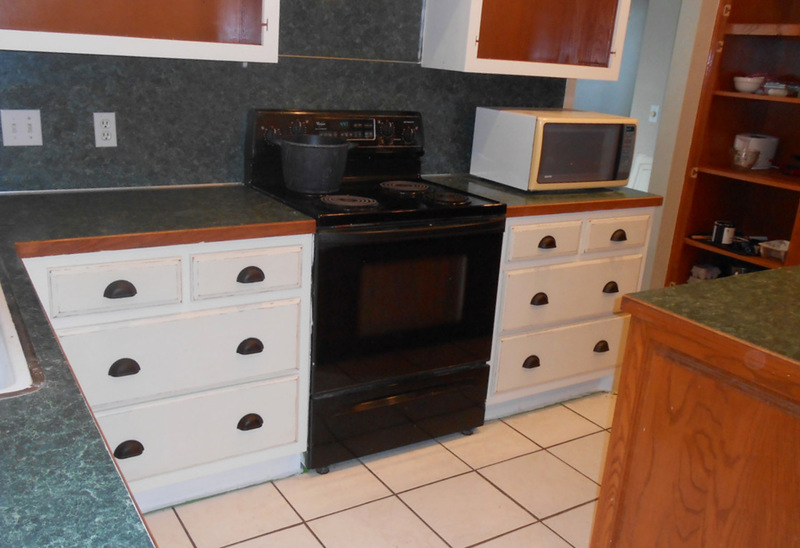 Polyurethane (and Varnish) will also yellow anything that it is applied onto so if you wanted white cabinets you will get white-yellow cabinets in the end. As polyurethane continues to age, it yellows even more. 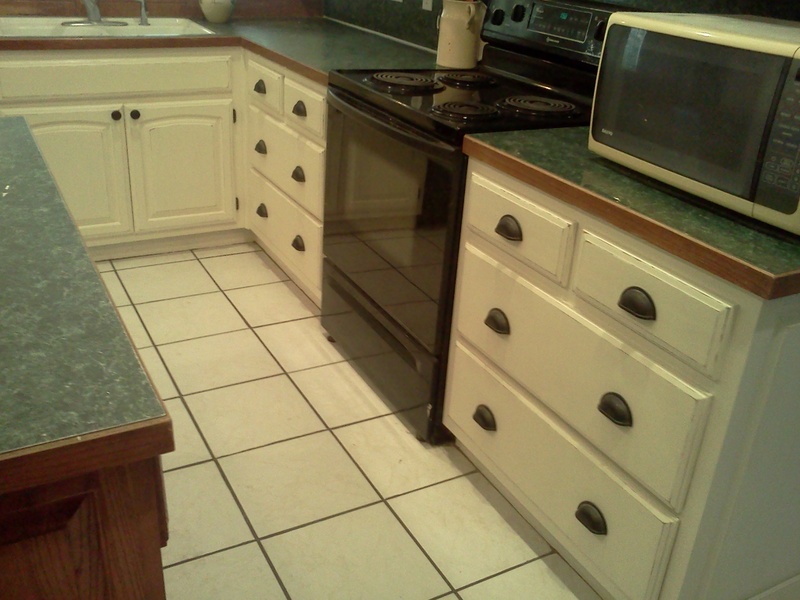 If money was no object, I would probably have paid for the cabinets to be professionally coated and sealed. However, this is a DIY project so I do what I know I can afford and can achieve on my own. 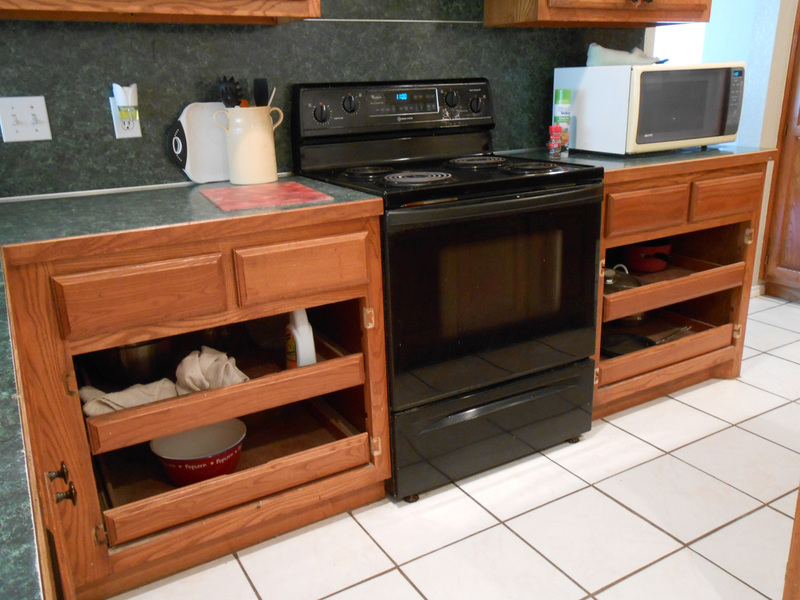 Since this is a big project – far bigger then one blog post, I will be putting together several entries about how the kitchen was done, over the next several weeks.